It’s that time of year again. Sales bonus time! Oh no, wait, it’s Christmas time. But hopefully you received your bonus too. In the spirit of the festive season, everyone at noCRM.io wants to take this opportunity to wish all the salespeople across the land a very merry Christmas and an amazing New Year. We’re sure that you’ve been working hard for the last 12 months, reaching those targets and converting leads into clients (especially if you’ve been using noCRM.io to manage your leads and prospects. #justsayin’). Now is a time for reflection, partying, overeating, partying, Christmas pudding, partying, and getting ready for New Year. Which starts with a party. Then it’s on to the serious stuff. Making 2018 even better than 2017. More sales, more money, and that thing all business love (other than money): Growth! This year saw You Don’t Need a CRM create noCRM.io. We did this to provide you with an even more intuitive design and clean interface, making it easier to manage your pipeline. Since the launch, we’ve been working hard to offer the best lead management software available. We’re always speaking to our customers, listening to their feedback and finding new ways to improve the service. Thank you to all of our customers. 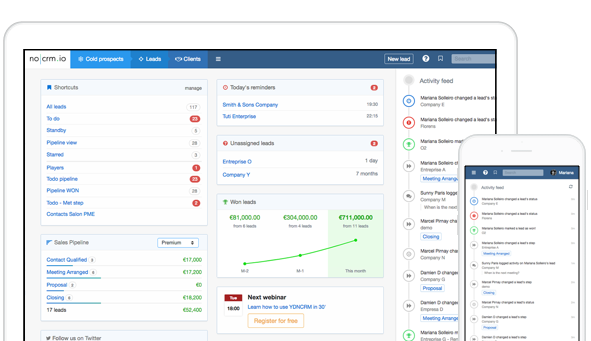 We’re excited about taking noCRM.io to the next level in 2018 and offering you an even better lead management software. We’ll also have a brand new blog page where you can get the latest sales insights. Ok, we think three plugs is enough. But really, it’s all about the festivities. So, once again from the noCRM.io team, have a fantastic Christmas, and we hope 2018 brings more success and makes you even better salespeople.